Cryptolocker virus (“Troj/Ransom-ACP”, “Trojan.Ransomcrypt.F”) is actually a Ransomware software and whenever it infects your PC, it encrypts your important files and it is practically hard to be decrypted. What is "Awesomehp.com" ? “Awesomehp.com” is a browser hijacker program that modifies your Internet homepage and search provider to “www.awesomehp.com” in order to redirect browsing results to ads from unknown publishers. How to Uninstall DESK 365 Malware Application? What is "Desk 365" ? “Desk 365” is a potentially unwanted program (PUP). Desk 365 is a suspicious program and is categorized as a potentially unwanted program (PUP). This category of programs (PUP) can harm your computer because they may contain malicious code. What is "Mobogenie" ? 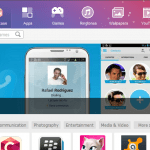 “Mobogenie” is an phone manager application designed for PC users and their Android phones. Mobogenie is a suspicious program and is categorized as a potentially unwanted program (PUP). This category of programs (PUP) can harm your computer because they may contain malicious code. What is “SaveSence” ? "SaveSence” pop-ups is a browser adware add-on that displays coupons and offers from unknown vendor when you buy online. How to remove Nation Zoom browser redirect? What is "NationZoom.com" ? “NationZoom.com” is a browser hijacker because it is usually installed on common Internet browsers without user permission and it modifies browser settings in order to redirect browsing results to ads from unknown publishers. What is "triple-search.com"? “triple-search” is a browser hijacker because it is usually installed on common Internet browsers without user knowledge and it modifies browser settings in order to redirect browsing results to ads from unknown publishers.